This will be a series of multiple posts to answer the question. I’ll review both commercial as well as Open Source SOA/ESB’s to answer the question. Recently I was working on an integration project where the database used was MS SQL server and the integration platform was Oracle SOA Suite. The service itself was quite simple – to fetch some data from SQL server and Enqueue it on JMS queue. We used DB Adapter for polling the database. We used the Delete strategy and the service was distributed on a cluster. Once the ids were enqueued, there was a seperate EJB-based webservice which queried same database to create the canonical. We have used JPA Entity Beans for ORM. There is a particular query to get some extra information from a table which does not have foreign-key relation. The query used a single parameter – a string. However we observed a huge performance issue for SQL server as well as the website hosted on the database. We observed 99% CPU usage. It was our SQL DBA who found out the issue. The column in database was varchar, the index was based on same. However, the query parameter that got sent to the database was using nvarchar. This caused a full table scan and completely skipped the index. The solution use “sendStringParametersAsUnicode” property of Weblogic SQL Server driver. By default everything gets sent as Unicode from JDBC Driver, using “sendStringParametersAsUnicode=false”, we made the driver send the parameter as varchar and immediately saw the difference. CPU usage was down to 1%. This underscores the point that Frameworks and Engines abstract out a lot of features, but it is necessary to understand you database to make optimal use of it. With the advent of cloud, the trend is to use cloud-based best of breed software for different needs. Although this provides very good and deep functionality, it also opens up a lot of issues related to data management and integrity. A very common scenario nowadays is to use SaaS application like Salesforce or SugarCRM for CRM. Then to use SaaS ERP like NetSuite or on-premise ERP. There could also be Quickbooks used for accounting. Besides these there are the HelpDesk apps. All of these applications have their own internal databases, schemas and representation of your data. A change in one place needs to be reflected in other apps as well. This results in lot of difficulties on how to integrate the apps. Conventional star topology or app-to-app integration fall short. This is where a Messaging Oriented Middleware (MOM) solution like ESB is very useful. I am presenting a generic architecture for multiple apps to apps integration. Purchase Order – This is the input document that comes to the system. We generally need to update multiple systems based on the docuemnt. The format could be cXML or any custom XML schema. It could be transformed into a standard or canonical format accepted internally. ActiveMQ JMS – The document is put on Topic of any messaging application. I have assumed ActiveMQ here, but it could be any MQ system that supports publish-subscribe model. Transformers – We have 3 subscribers to this Topic, however each of them accepts different formats. To compensate for this, we have a trasnfromer for each of the subscriber. e.g., the PO to CRM transformer could transform the message from CXML format to SalesForce.com Schema. Subscribers – All 3 subscribers receive the message document and update their respective system with the data. This is second of the series Enterprise Integration Patterns (EIP) with OpenESB where we will cover Enterprise Integration Patterns using OpenESB. The Dynamic Router is a Router that can self-configure based on special configuration messages from participating destinations. We can realize this pattern in OpenESB using Dynamic Addressing which uses WS-Addressing to dynamically determine the service location at runtime. EJB Module implementing the Web Service – you can use any WSDL based web service, not necessary to use EJB. BPEL – This will contain the actual code that determines the endpoint at runtime. JBI / CASA – This is a composite application necessary to deploy the BPEL. Step 1 – We create a web service with 2 operations – addition and subtraction. Both operations take 2 numbers as input and return result. <!-- A partner link type is automatically generated when a new port type is added. Partner link types are used by BPEL processes. In a BPEL process, a partner link represents the interaction between the BPEL process and a partner service. Each partner link is associated with a partner link type. Note that I’m returning the machine name in the response. This’ll help us to determine who actually processed a particular operation. The portname and Service name must match to the ones in target service. This is first of the series Enterprise Integration Patterns with OpenESB where we will cover Enterprise Integration Patterns using OpenESB. The Content-Based Router examines the message content and routes the message onto a different channel based on data contained in the message. The routing can be based on a number of criteria such as existence of fields, specific field values etc. When implementing a Content-Based Router, special caution should be taken to make the routing function easy to maintain as the router can become a point of frequent maintenance. 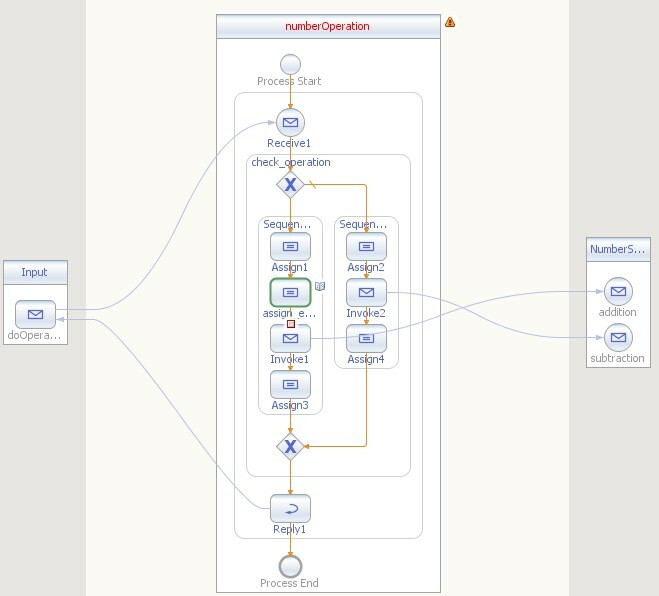 In more sophisticated integration scenarios, the Content-Based Router can take on the form of a configurable rules engine that computes the destination channel based on a set of configurable rules. It can be achieved in OpenESB using “If” component. In this example it simply checks for the value in “num:operation” element. Can a SOA be designed with REST? Recently I answered a question on stackoverflow.com asking can a SOA be designed with REST? I’m cross-posting the answer here. At a high Level the answer is Yes, however not completely. Being able to compose new higher level services or business processes is a basic feature of a good SOA. XML, SOAP based Web Services and related standards are good fit for realizing SOA. Standardized service contract – Services adhere to a communications agreement, as defined collectively by one or more service-description documents. Service Loose Coupling – Services maintain a relationship that minimizes dependencies and only requires that they maintain an awareness of each other. Service Abstraction – Beyond descriptions in the service contract, services hide logic from the outside world. Service reusability – Logic is divided into services with the intention of promoting reuse. Service autonomy – Services have control over the logic they encapsulate. Service granularity – A design consideration to provide optimal scope and right granular level of the business functionality in a service operation. Service statelessness – Services minimize resource consumption by deferring the management of state information when necessary. Service discoverability – Services are supplemented with communicative meta data by which they can be effectively discovered and interpreted. Service composability – Services are effective composition participants, regardless of the size and complexity of the composition. A SOA based architecture is expected to have Service Definition. Since RESTful web services lack a definitive service definition (similar to wsdl), it is difficult for a REST based system to fulfill most of the above principles. Orchestration is required to compose processes. That’s what provides the main benefit of SOA. 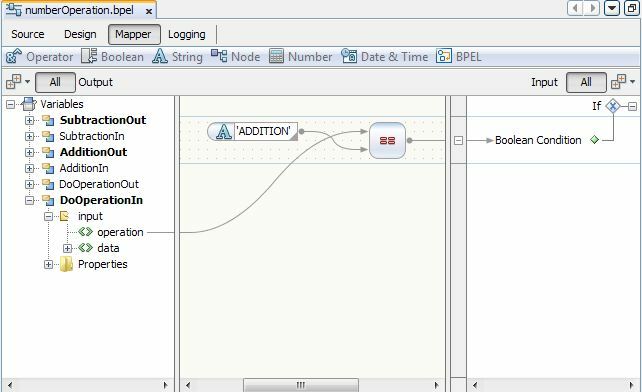 Initially you created a process (using BPEL) which uses these operations in sequence. You have clients who use this Composed Service. After a few months a new client comes who has tax exemption, then instead of writing new service, you could just create a new process skipping the addTax operation. Thus you could achieve faster realization of business functionality just by re-using existing service. In practice there are mutiple such services. Thus BPEL or similar (ESB or routing) technology is essential for SOA. Without business use, a SOA is not really a SOA. This is a series which’ll cover Enterprise Integration Patterns (EIP) using OpenESB.